Alfatihah... Thank you for this post. You might think it' insignificantly short but it brought tears to my eyes. 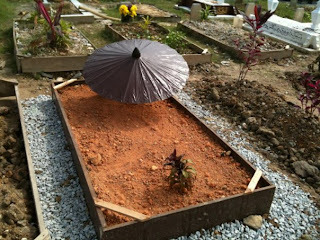 2010 will definitely be a better year for us... Al-fatihah for your atok too. Grief and bereavement phase is a normal process for loss of love ones. It will take time for us to adjust our life with such loss. I pray that we will be able to overcome the phase successfully and full redha. Deepest condolences to all who were dear to Hasnah, I just came to know about her passing yesterday, it is sad when one loses a dear one to cancer, my dad died from it and now my mum too is suffering from it, it is a terrible disease. Actually, I know Hasnah from primary school and then sec. at Technical Inst, KL and we(ex-students) are in the process of reuniting ex-schoolmates. May her soul rest in peace and take care of her loved ones from above. I'm sorry for writing this so late as I just got to know about your aunt. My condolence to you and you family for the passing of your aunt, Hasnah. Arwah Hasnah was my friend when we were in school, from primary right up to secondary school. My name is Hasinah Abdul Ghani,I don't know if your aunt had ever mention about me. I have been to your grandparent's house in Kg Puah long time ago. As at the time, takde phone, internet or cell phone, habis sekolah kita semua berpisah and masing masing hilang begitu aje. After so long,only recently, some of us got in touch and were trying to find all our classmate. Thats when a week ago, we found out about arwah Hasnah. Presently, I am in Maryland, USA. I read everything in this blog and I gather you live in Danau Kota. Insha allah, when I return to Kuala Lumpur, my mom lives in Setapak Garden, K.L. I would love to visit you. Again, inna lillahi wainna illaihi rajioon. May Allah forgive her sins and accept her in Jannah. May allah give all of you sabar. If you wish to write to me, my email address is hasinahj@yahoo.com. semoga Allah mencucuri rahmat ke atas roh arwah.. I am your aunt's friend. I Just got to know about her passing. We were friends from primary right until secondary school. We lost contact after that. Presently, I am residing in Doha, Qatar but I go back to Malaysia during school hols. I'd love to visit your grandma the next time I balek cuti. Sekali lagi, takziah buat Eya sekeluarga.